May is Melanoma Awareness Month. Summer is just around the corner and many of us are looking forward spending more time outdoors. Again, it’s melanoma awareness month and we are here to assist in raising awareness of the risks of harmful UV rays. Melanoma is the most serious type of skin cancer. It develops in the cells that produce the skin pigment – melanin. 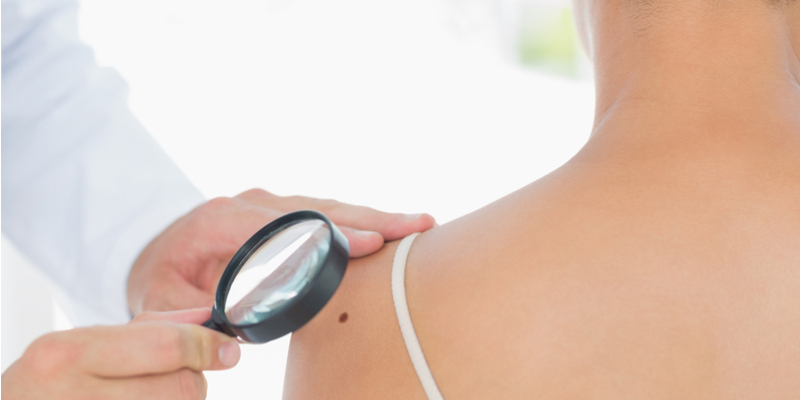 Melanomas can occur anywhere on your body. They most often develop in areas that have been exposed to the sun, such as legs, arms, back, and face. Let’s start with the fact that melanoma is often caused by exposure to high levels of sunlight. Excessive sunbaths as well as using the sunbeds might lead to burnt skin. What many won’t notice is that even years after the skin was burnt, a mole can become malignant a.k.a. cancerous. It is a scary fact, but very true: blistering sunburns during childhood or teenage years can cause skin cancer many years later. Excessive sun exposure, as well as previous exposure to the sun and tanning beds, are established risk factors, but there are other causes too. Everyone must know: prevention is the key. Rule number 1: use the adequate sunscreen and enough of it. Rule number 2; wear the sunscreen all year round. Other than that seek shade or avoid the sun during the peak hours, wear a hat with a wide brim to help shade your eyes, ears, and head. Also, use extra caution near water, snow or sand as they can reflect damaging sun rays. Choose lightweight, loose-fitting clothing such as long-sleeve shirts or long pants that protect a larger area of your skin. And don’t forget: have fun in the sun, but be safe too. Call 604 877 1299 for more info!